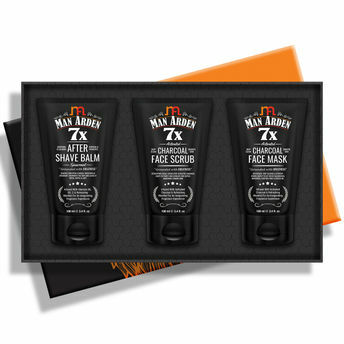 Man Arden Face Care Gift Box For Men is one great option for taking overall care of the facial skin of men. Man Arden 7X After Shave Balm (100ml): After Shave Balm - Man Arden After Shave Balm enriched with vitamin C, menthol, hyaluronic acid, natural extracts and oils combines the benefit of a balm, which refreshes and revitalizes the skin, with that of a soothing, yet lightweight cream. It is the ideal way to calm redness or irritation caused by shaving. This after-shave balm hydrates and immediately soothes the skin, preventing irritation and feelings of tightness and fortifies and protects the epidermis from daily irritants. Man Arden 7X Charcoal Face Scrub (100ml): Indulge your skin in detoxifying ingredients and nutrients with the Man Arden Activated Charcoal Face Mask. It clears dead skin cells thoroughly while retaining skin balance and hydration for that perfect glowing and refreshed feeling. The activated charcoal mask with vitamin C and menthol is well-loved by many beauty experts. Nourishing and ultra-effective wash off formula deeply cleanses while purifying the skin of impurities, dirt, oil, and acne. Man Arden 7X Charcoal Face Mask (100ml): Say Hello to this Detoxifying Charcoal Face Scrub which works like a magnet to draw out and trap deep down dirt, oil and impurities while also absorbing excess oil. Welcome glowing skin with vitamin C and uplifting magic with menthol. During the day our faces are exposed to endless chemicals, pollutants, bacteria, sunlight, and more. This natural, easy-to-use scrub works in synergy with your body to fight back and remove these harmful pollutants. It is the natural skin care treatment that exfoliates dead skin cells, improves skin tone, cleans and tightens pores, fights acne, removes excess oil, blasts cellulite and even helps reduce fine lines and wrinkles.